Read the latest newsletter here! If you want to head straight to the actions,check them out here. 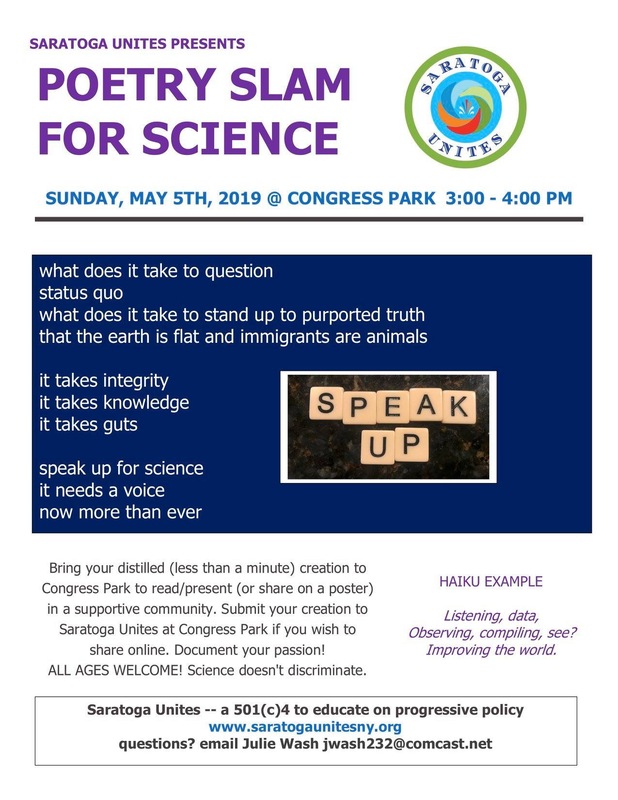 Saratoga Unite Hosts a Poetry Slam for Science! The Saratoga Unites candidate forum for Saratoga Springs City School District candidates was a great success! The five candidates able to attend, Natalya Lakhtakia, John Brueggemann, Heather Meyer Reynolds, Shaun Wiggins, and Ed Cubanski, responded to questions on a variety of topics. It’s clear, that while this year’s race has been promoted mostly around the question of increasing armed resources in our schools, that the community has a much larger number of concerns and interests to ensure a quality education in an everyday safe school environment. 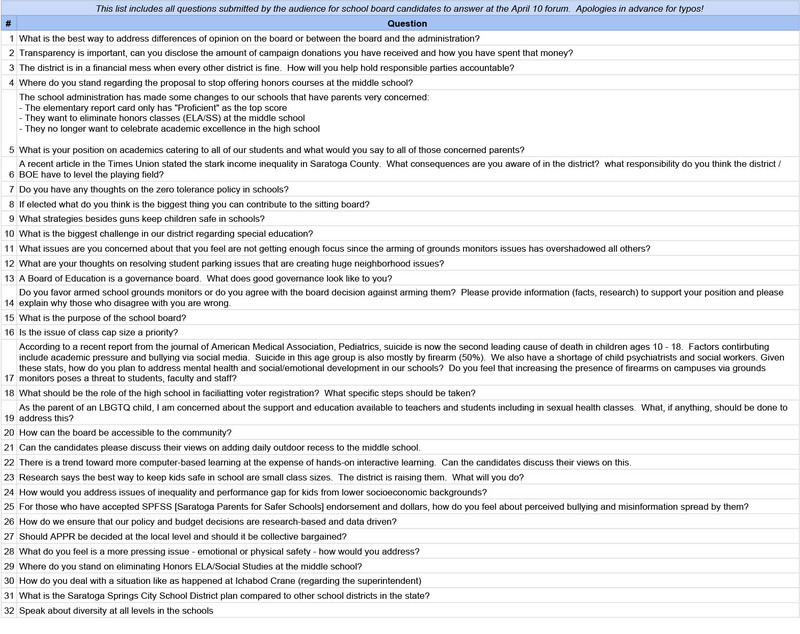 Check out the variety of issues reflected in the questions submitted for our candidates – and make sure to be encouraging dialogue with the candidates on all of these topics! We urge all voters registered in the school district to evaluate the candidates across a wide range of issues – and if you’re interested in learning more about everyday safety, check out a new Facebook group dedicated to that topic, Saratoga CARES (Coalition Advocating Real Everyday Safety). There are three open positions for school board: mark your calendars and plan to vote on May 21! Saratoga Unites, Inc. is a community organization dedicated to uniting groups and individuals to uphold democratic values and advocate for equal rights, equal opportunity, a healthy environment, and a more peaceful world. Inspires debate on issues by encouraging new perspectives and collaborations with OUR LOCAL, STATE & NATIONAL AGENDA. Saratoga Unites, Inc. is part of a new generation of activist organizations that addresses the interconnected nature of today’s policy challenges. We strive to educate the public and advocate for social change where human rights are first and foremost, in all arenas, including where populations are being manipulated by distorted information on matters affecting their livelihoods and health and well-being.